Two walkers were rescued after getting stuck in a steep Lake District gully. The pair called for help after they found they could neither go up nor down from their position above Borrowdale. Keswick Mountain Rescue Team was called out at 9.15pm today to the site near Grange. A team spokesperson said: “Two inexperienced walkers attempted to descend from the High Spy-Maiden Moor ridge direct towards Hollows Farm. “They got into a gully which looked to be a possible descent route, but then got to a steep section which they could not get down, but neither could they retreat. The situation was further complicated by the fact that they had no map. “However, with some careful questioning, it became clear that they could actually see the Allerdale Ramble path, and were probably close to Goat Crag. After a bit of shouting, observing, and hunting by team members, they were eventually located in a crag section just above the Hollow Stone. The rescue operation lasted almost 2¾ hours and involved 17 volunteer team members. Earlier in the afternoon, Keswick MRT was called out after a 15-year-old girl slipped and aggravated an old knee injury while walking with her mother on Cat Bells and couldn’t bear any weight on the leg. The spokesperson said: “The team sent out two vehicles, and one of the team paramedics attended direct from home. “She was assessed and splinted at the scene, and given analgesia. The team then opted for a direct descent with the stretcher through the bracken, creating a new footpath in the process, and arrived down at the road, where a [North West Ambulance Service] ambulance was waiting to transfer her to the Cumberland Infirmary for treatment. Ten team members took part in the rescue which took just over 1½ hours. 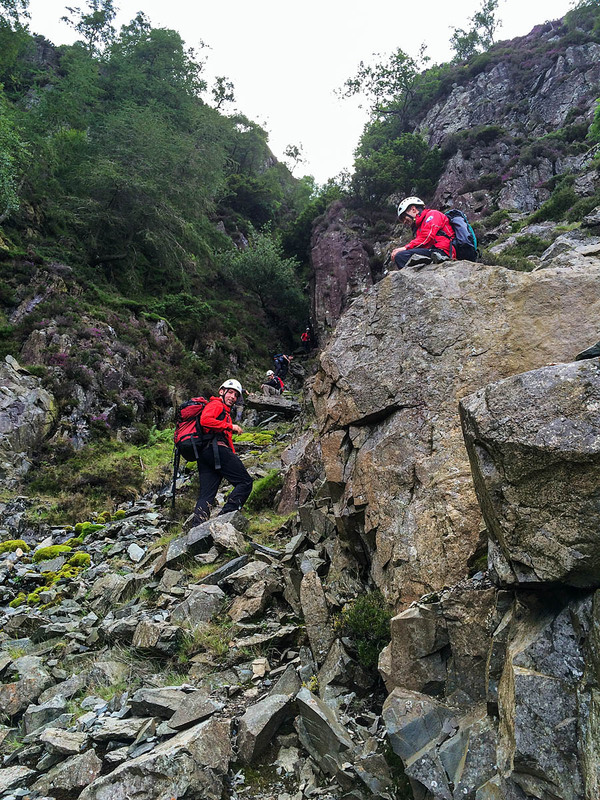 The incidents were the latest in a busy period for the Keswick team, whose members were called out on Tuesday when a 20-year-old woman taking part in an organised scramble in Stoneycroft Gill trapped her foot between two boulders and fell, injuring her ankle. The team spokesperson said: “The group instructors managed to free her from the boulders, but were unable to extricate her from the gill. “Team members were able to position a stretcher close to her, get her on board and then heave the stretcher up the bank to a point where they could then carry her. Twelve team members were involved in the rescue. On Monday, the team was called out when a woman stumbled and fell while walking on the Lodore path near Watendlath, injuring her neck and shoulder. The spokesperson said: “The team despatched one Land Rover full of personnel immediately, followed by one of the team Sprinters.